We’ve really enjoyed Agos-y-Mor for itself, its wonderful position. We played in the waves (in wetsuits) in Caerbwdi Bay, trudging up to the house wet and smiling for a cup of tea. Bliss! Our best holiday ever, in the best location ever. What did we like about the cottage? Everything! We had many coastal walks, and the fantastic views will stay with us, though we had to rush out and buy some sun cream! When relaxing at the cottage, the wildlife reminded us of Snow White: butterflies, birds and bunnies everywhere! We would love a return trip - thanks for having us! What can we say… the whole holiday was magical; cottage was so comfortable – bliss on very sunny evenings and cosy on sunny days. Bed was lovely. Cottage was warm on chilly mornings. We both have found it hard to describe the view – “fantastic”! 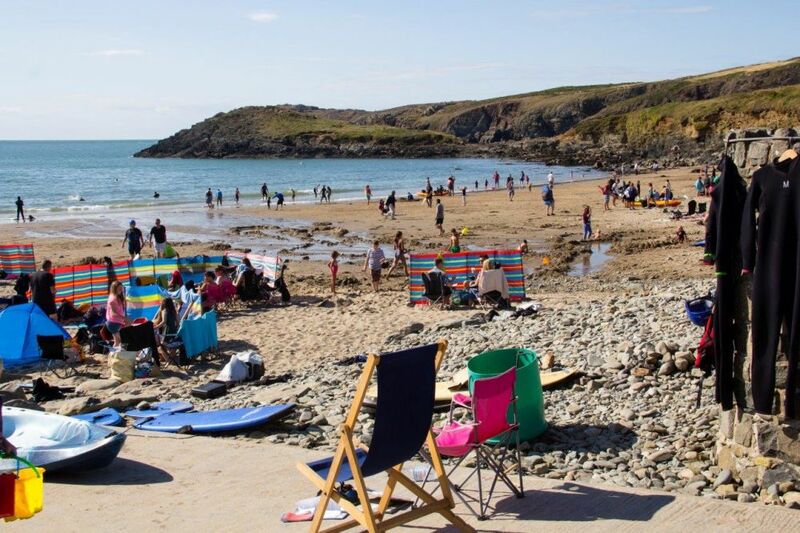 This has been the best holiday we have ever had in Pembrokeshire – thank you! Fantastic location. We arrived in rain, but this quickly changed, and the view with the sparkling sea was magical. Our girls (5 and 3) didn't want to go home. They loved walking down to the beach before bed-time; we did manage to experience the sand on the beach (at low water). Didn't see any wildlife, except for two goldfinches - but we probably made too much noise! Garden great for children. Cottage very comfortable, with good cooking facilities. Eleven goldfinches on the stone table in front of the cottage – is this a record? Cottage so quiet and peaceful, delightful track to cove, where we spent lots of time. Another great week in Pembrokeshire. Looking forward to returning next May – it’s addictive! Compact but cosy cottage. Lovely peaceful week, and no complaints! Never tired of the view – whether in bright sunshine or driving rain! Super location. Thank you! Amazing views, great snorkelling and sea swimming in the bay below. Perfect for a family – so safe. The highlights: foxes, goldfinches, chaffinches, bullfinch, swallows, house martins, rabbits, thrush, bunting, buzzards, kite, hawk, variety of seagulls, pheasant arrives around 8:45pm; fantastic views, lovely sunny afternoons; definitely coming back! 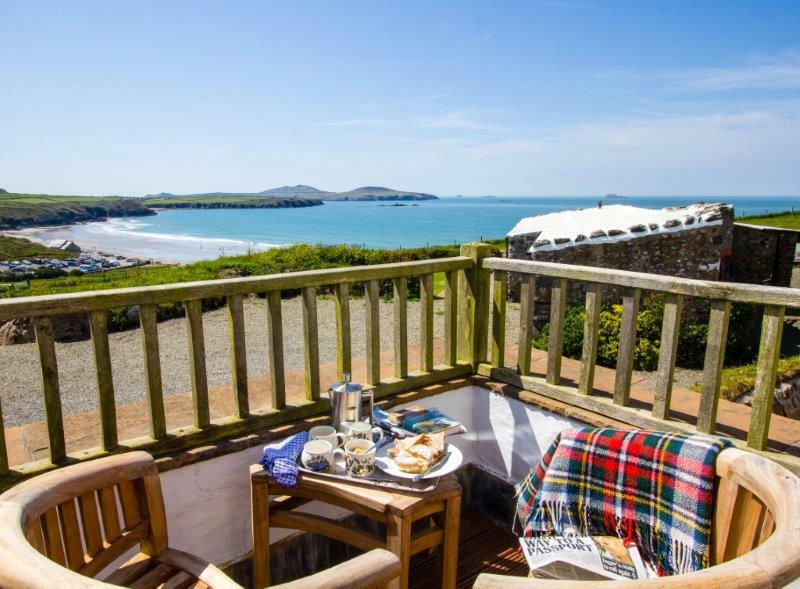 We have been holidaying in St Davids for the past nine years, and this has got to be the best location - what views! We will be back again for next year! Fantastic location for our holiday; a view that would be hard to beat. We have never tired of watching the various birds visiting the rock table in front of the conservatory, and the rabbits and fox in the lower field. Meals in the cottage were most enjoyable, sitting in the conservatory among the wildlife, enjoying the views. Love to return here. What a wonderful week in a delightful cottage. We never tired of the view and the stone outside made an ideal bird table for robins, blackbirds, goldfinch and a whole family of chaffinches. The house was very comfortable – we would love to come again! We have had a wonderful week, with only one day of rain. This is a lovely cottage in a splendid place for all ages. Sixth year staying here at Whitesands. I have never surfed a six foot wave in a kayak when there is no wind, and lots of sea! The kids loved it, and wife doesn't want to go home. We will be back again (and again). Roll on next year! Furthest we went was St Davids - why would you want to go elsewhere? Walked on the beach when not surfing, and the tide was out. It was an adventure! It was good to be back for another year in the nice house with good views! Awesome: coastal walks, surfing, body boarding, swimming, lazy days on the beach, endless games of cards, beach cricket... Hope to be back soon! Great to be back. Much appreciate improvement in decor. We've been blessed by weather, and have had idyllic bucket-and-spade-and-fishing-nets-times, and swimming. Thank you. A fantastic week, with only one part-day's rain. Everyone had a really lovely time, almost all on the beach - some surfing, lots of sandcastles and play! Thanks again for another great week - fantastic weather at the end of the week, which made for a perfect few days. Lovely house! The weather was very kind to us, with just one day of cloud cover. We went on a puffin trip around Skomer from Martin's Haven and bought fresh crab from Solva. A relaxed and enjoyable few days, and the consensus is that we will be back again if John can arrange for the same weather. I had a lovely time here. I body-boarded every day. We climbed up the mountain: there should be a water slide from the mountain to the house, and from the house to the beach! There should also be an escalator and a conveyor belt back up. I had a lovely stay and hope to come again! What a fantastic week: best weather we have had for 10 years down here. This is still our favourite cottage we have stayed in, hence why we’re booked for next half-term. Can’t wait until next time! What a relaxing week! We have yet again had a lovely time and enjoyed Foxhole enormously. Thank you. Lovely, lovely holiday: perfect weather, beautiful coastline, magnificent sunsets and night skies. We love it here! Thank you once again – we have had a wonderful time. Fantastic time here at Foxhole Cottage: warm and cosy, views are fabulous. Have been coming here as a family for over 20 years and it is still a special place. Weather has been kind to us: from snow in Caerphilly to sun at Whitesands! Back again at Foxhole. Had a fantastic Christmas. The cottage is really toasty and warm, and the shower is magic. The best cottage in Pembrokeshire for spending the winter months. I would suggest an early morning walk over to St Davids Head to watch the porpoises feeding off the headland; and look out for the Merlin along the way! Ty Gwyn is the house with the most character we’ve stayed at and by far the best location. Excellent position close to the beach and coastal walks… nice views from the windows. Saw the ponies at St David’s Head and toasted marshmallows. Ideal position for visiting resorts north and south, which we did on a few occasions. All in all the family had a lovely holiday. Will recommend to family and friends! This is our second visit to Ty Gwyn, and we are still in agreement that this is a very charming house in a stunning location. Thank you. Our family has been coming on holiday to Whitesands for over 50 years. It was our first time at Ty Gwyn, and we have had a fantastic time… We’ve enjoyed surfing and walks to St David’s Head to watch the sunset. The house has been wonderful – cosy and full of character. Falling asleep to the sound of the waves has been a real break. Thank you for sharing your magical house with us. A wonderful slice of family cement! 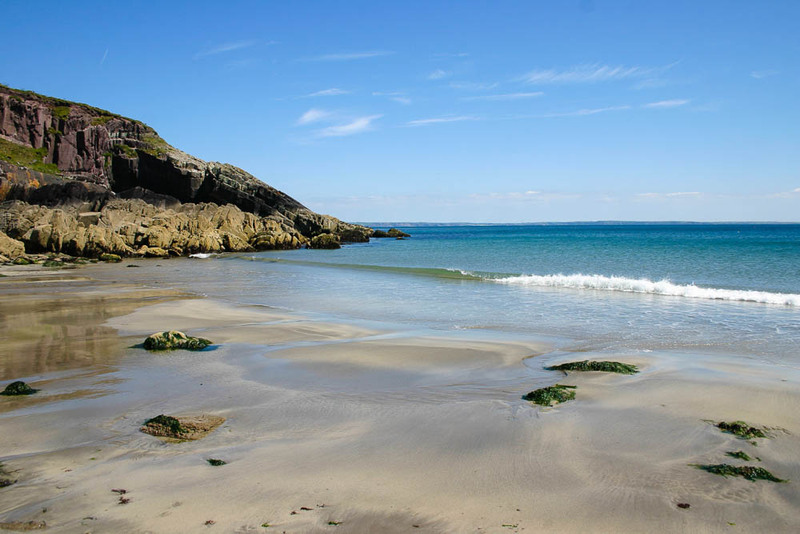 The beach was marvellous… coast as beautiful as ever. Many thanks indeed. First time at Ty Gwyn – superb and magical location. It was our first time here and we loved the character of the cottage and the stunning views. A wonderful time was had by all! Our 21st year at Ty Gwyn! As usual, a fantastic time…already counting the days ‘til next year! Thoroughly enjoyed our stay – have been coming here for over 30 years. The house is in a lovely spot. We will be back to the area I am sure.